It's never too late to start planning your year! I've moved beyond setting New Years Resolutions but rather doing intention setting. My first time using a planner ever was in 2016. Besides helping me to remember things I was starting to forget, I believe there is power in writing down your plans and visions. I have not committed to one planner that I have used over and over again. In 2016, I used the Erin Condren planner and in 2017 I used Lara Casey's Power Sheets. You can read about them here. However this year, I have opted for a new planner that combines both functionalities of my previous planners. In 2018, I will be using The Layered Living Planner. I found out about this planner from two influencers on Instagram. I am excited because the company is black owned. MAJOR WIN! The planner is sold out unfortunately, maybe they will do another printing and release more. However, I love that it combines goal and intention setting with a calendar. Two things that were lacking big time in other planners I have used. I am excited to dive into this planner and set out my intentions on paper. In addition to using a planner, I have my vision board prepped and ready to go. I have it sitting in my bedroom next to my TV. I look at it every morning when I wake up and every night before I go to bed. I started meditating this year, and I want to incorporate more manifestation mantras into my meditation practice. This is my 6th year using a vision board and I wanted to be way more intentional with it. Prior to starting my vision board, I wrote down 2-3 tops goals for Health & Wellness, Dating, The Boonie Breakdown, My Career, Travel Plans, and My Finances. It took me longer than normal to finish my board, but I know that it accurately represents my vision for the year. In episode 41 of the podcast, I talked about my goals for the year in more detail. 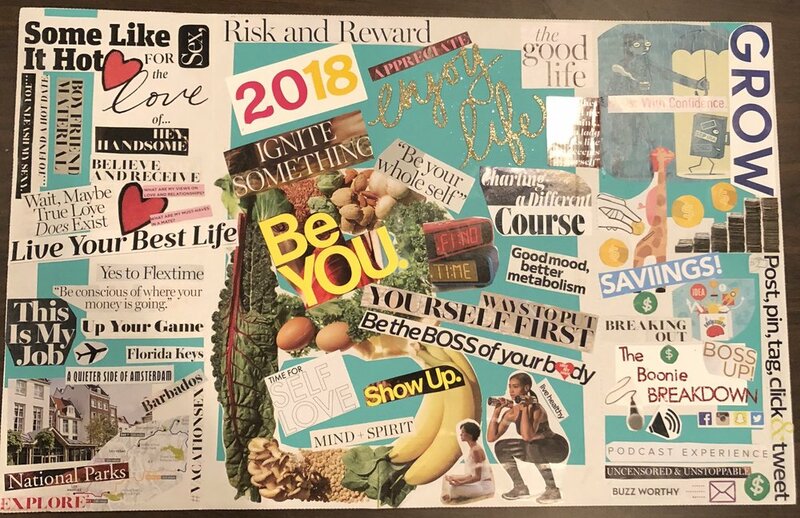 So I have my planner and my vision board and ready to kick it in to high gear in 2018! What planner or other tools are you using for 2018 to kill your goals, let me know in the comments!